Unless you’re looking at a tombstone, you’re probably not going to notice or certainly not think about the little line between the person’s birth date and death date. And even when you see it, you may not really think about and reflect on what that line means. It means everything! In between those two dates is life – the life of a person. That little line says it all. How did you live? What was your life like? A stone dedication, known as the unveiling, was done for my mom today. This occurs within the first year of passing. It’s been eight months since my mom died. I wanted to do it before the cold set in. It was a most meaningful and intimate ceremony at the graveside. My mom’s rabbi spoke so gently and beautifully, reflecting on the prayers for the dead and specifically on my mother. As I listened and looked at the new footstone with the ivy planted around it just in time for today’s unveiling, I took note of that little dash between her two dates. I thought if I had to sum up her dash in a few words it would be, giving to others. That was the overriding theme of my mom’s life. In Hebrew the word is ‘mitzvahs’ – good deeds. This was my mother- always in the service of others, both professionally and personally. 97 years is a lot of living. And she lived it actively engaged in a very meaningful life. She naturally had her share of challenges and hardships. And through it all she maintained her integrity, strength and raison d’etre. How are you filling your dash? The way you want? With what matters to you? 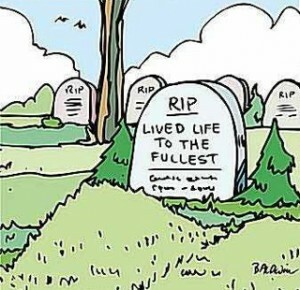 Death, cemeteries, eulogies, these things can give us a kick in the pants, reminding us to live well, to thrive and not just survive or exist; to elongate that dash with intent and purposefulness and not shorten it with robot-like living, sleep-walking through this only life of ours. So dig deep and chisel out that line, and live your dash to your fullest. When that end date comes, just as it’s carved into the stone, so may that dash be deeply engraved into the heart and soul of all whom it touched. Enjoy the poem, The Dash, and this beautiful video of it.